A Fun Inspirational Full-Color 11 x 14 Print-Out for your Classroom! Join Florentina and some of her MyKids Unite©Team Friends to start the conversation on building self-esteem, self-worth and individuality! An awesome visual tool that will inspire students of all ages and all abilities to share and celebrate their unique gifts with you and their fellow students! Ideas! Full classroom participation where each student verbally shares, or incorporate an art project where each student creates their own MyKids Unite© Friend Character and lists attributes to share with the class and community! We all have Super Powers which deserve to be Celebrated! 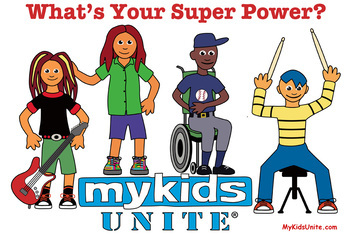 Why not make it fun with the MyKids Unite© Team leading the way? !